The 14 developing member countries (DMCs) of the Asian Development Bank in the Pacific constitute a diverse array of 7,500 islands scattered across an area of 30 million square kilometers (km2). As of 2013, 10.7 million people inhabited these countries. The Pacific has varying topographies, cultures, and economies. Many islands are small and geographically remote, with fragile biodiversity and a limited natural resource base. These features make the region particularly vulnerable to global warming, with increasing and more intense cyclones, floods, and drought. Climate change affects food production and uses of land, coastal, and marine resources; damages infrastructure and water resources; and adds risk to human health. All in all, economic costs of climate change have been large and are expected only to increase. In the 1990s, extreme weather cost the Pacific region more than $1 billion. In 1990 and 1991, cyclones Ofa and Val alone cost Samoa $440 million—more than the country’s gross domestic product (GDP). Cyclone Heta in Niue wrought $27 million in damages (25% of its GDP). And in early 2005, the Cook Islands faced five cyclones within 5 weeks—four of which were Category 5. In February 2008, Fiji lost $32 million to Cyclone Gene, forcing the government to provide $1.2 million in food rations. Clearly, the prosperity, stability, and security of the Pacific will depend on how the development challenges associated with climate change are tackled. The Economics of Climate Change in the Pacific study focused on Fiji, Papua New Guinea (PNG), Samoa, Solomon Islands, Timor-Leste, and Vanuatu. It followed a three-step strategy, using state-of-the-art models. First, a regional climate model downscaled to a 20 x 20 km resolution was set up. Second, sector impact was assessed to quantify potential impacts of climate change on selected key sectors in the Pacific—agriculture, fisheries, coral reefs, tourism, and human health. Third, an economic assessment of climate change impacts in the Pacific was conducted. Following are the results. Average temperatures in the Pacific are expected to rise between 2.0oC and 3.0 oC relative to the 1990 level by 2070. Climate downscaling shows that annual mean temperatures would increase for all six selected Pacific countries under a medium emission scenario (A1B) and a high emission scenario (A2) from the 4th Report of the Intergovernmental Panel on Climate Change.1 By 2070, Fiji and Samoa are projected to experience a temperature rise of approximately 2°C on average from the 1990 level (i.e., more than a 2.5°C rise from the preindustrial level). PNG, Solomon Islands, Timor-Leste, and Vanuatu are expected to experience an increase of more than 2.5°C on average by 2070, with some areas in these countries experiencing an increase of nearly 3°C in the same period relative to the 1990 level (Figure 1). Under higher emissions scenarios, temperature increases would be even more pronounced. Greenhouse gas emission scenarios from the 4th Report of the Intergovernmental Panel on Climate Change. Since the finalization of this study, the IPCC has issued its Fifth Assessment Report (AR5). Working Group 1 projected climate change based on Representative Concentration Pathways (RCP) similar to AR4 in both patterns and magnitude after accounting for scenario differences. The frequency of El Niño Southern Oscillation (ENSO) cycles is likely to increase, leading to potentially more extreme weather events in the Pacific. The frequency of El Niño and La Niña events could increase in the future. Many climate models point to an increase of over 40% in the Pacific under A1B and A2 scenarios. One effect would be unexpected heavy rains and dry episodes. The effects of ENSO on rainfall could be considerable, causing either too much or too little rain depending on the areas and the seasons. Extreme temperatures are expected to increase in all six countries. Bobonaro (Timor-Leste) would be the warmest; temperatures there could reach 44°C by 2070 under the A1B scenario. Extreme wind speeds and rainfall are also expected to increase. In Fiji, for example, maximum normal wind speeds would increase from current 60 km/h to a high of 66 km/h, and maximum rainfall would increase from 160 to 200 millimeters (mm) per day by 2070, bringing greater likelihood of high waves and strong gales. Sea-level rise poses risk of inundation to economically important coastal areas in the Pacific. Sea-level rise would put large coastal areas at risk of inundation. Although better elevation data are needed, high-range estimates suggest that by 2100 under the A1B scenario all Pacific island countries but Kiribati could face sea-level rise, ranging from 1.2 meters in the Cook Islands to 1.7 m in Solomon Islands; low-range estimates suggest sea-level rise of 0.5 m in the Cook Islands and 1.1 m in Solomon Islands. Airports and seaports, road infrastructure, and local communities, all of which are highly concentrated on coastal areas, could sustain significant damage from sea-level rise. Perhaps more importantly, there is risk that the already limited freshwater resources in the region may be severely affected by encroaching seawater. The effects of climate change on key economic sectors will be primarily negative, leading to potentially large losses in agricultural production. Some key economic sectors could sustain potentially high losses. In agriculture, impacts on staple food and commercial crops are assessed to show significant long-term declines in yields, calling for effective adaptation measures. Impacts on important marine resources, such as coral reefs, would be highly negative, but those on commercial fish catches would be mixed. Also, as a result of a less attractive climate, tourist arrivals are expected to fall along with their contribution to local and national economies. These losses could be further compounded by the adverse impacts of climate change on health and labor productivity. Economic impact could be alarmingly high. Assuming the world does not deviate from its business-as-usual scenario, the total cost of climate change in the Pacific will continue to grow prohibitively high over the long term, reaching 12.7% of annual GDP equivalent by 2100 (Figure 2a). Even under a low emissions scenario in which the global economy is assumed to restructure itself to be service-oriented, the economic loss would still reach 4.6% of the region’s annual GDP equivalent by 2100. If the atmospheric concentration of greenhouse gases were to reach 450 parts per million (ppm) of carbon dioxide equivalent, which would maintain global warming at approximately 2°C, the economic cost would be smaller but still would reach 2%–3% of GDP by 2100 (Figure 2b). Notes on scenarios used: A1B refers to high population and economic growth leading to medium emissions scenario. A1FI refers to high population and economic growth, fossil-intensive, and high emissions scenario. A2 refers to high population and slow economic growth, heterogeneous world, and high emissions scenario. B1 refers to high population and economic growth, structural transformation toward a service and information economy, and low emissions scenario. 450ppm depicts a low emissions scenario. 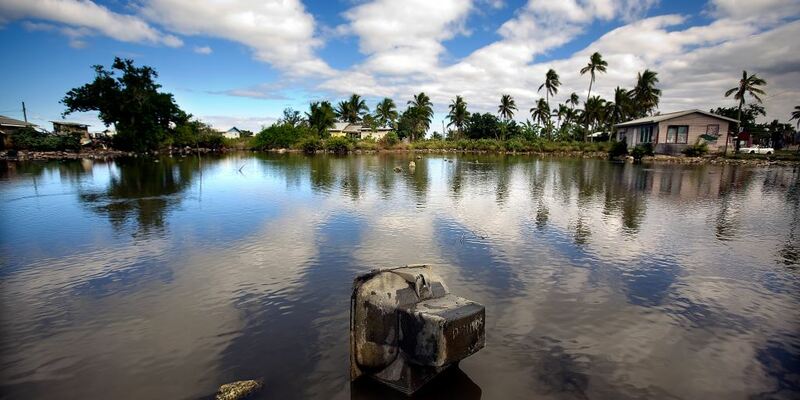 Substantial investment is needed to prepare the Pacific for climate change. The estimated cost for achieving climate-resilient development reflects the additional investment for offsetting the impacts of climate change and includes measures for building climate change adaptive capacity as well as climate proofing for key sectors. To prepare for the worst of the high emissions scenario A1FI, the funding requirement every year until 2050 could average $447 million or 1.5% of GDP and could go as high as $775 million or 2.5% of GDP. If greenhouse gas concentration stabilizes at 450 ppm of carbon dioxide equivalent, adaptation cost would be significantly lower, reaching an average cost of $158 million per year (See Table below). GDP = gross domestic product, m = meter, ppm = parts per million, SLR = sea-level rise. Note: The 95th percentile represents the critical point. Moving beyond, there is a low probability (at 5% chance) that would lead to a catastrophic outcome. 1Greenhouse gas emission scenarios from the 4th Report of the Intergovernmental Panel on Climate Change. Since the finalization of this study, the IPCC has issued its Fifth Assessment Report (AR5). Working Group 1 projected climate change based on Representative Concentration Pathways (RCP) similar to AR4 in both patterns and magnitude after accounting for scenario differences. The Pacific island countries will benefit from early climate action, as climate risks and costs due to impacts of climate change are expected to accelerate over time. Mainstreaming climate change actions in development planning is crucial for reducing vulnerability to extreme climate and promoting sustainable development. Climate mainstreaming requires integration of climate change objectives and agendas into existing national or multisector agency programs and policies. Adaptation planning needs to consider feasible cost-effective adaptation in the form of low-regret options, early climate action and disaster-risk preparedness and management plans, and strengthening capacities of Pacific DMCs to develop practical information and decision support tools. Increased financial and technical support for measures that will ensure continued economic growth in the face of climate change is needed for the Pacific region. Initiatives and activities that facilitate Pacific DMCs’ access to financing facilities that build climate resilience and promote clean energy development are essential tools to bridge the region with its financing and capacity needs. ADB. 2013. The Economics of Climate Change in the Pacific. Manila. Robert Guild is director of the transport and communications division at the East Asia Department. Prior to his current position, he was with the Pacific Department as director for transport, energy, and natural resources. He holds a doctorate in Planning and two master's degrees: one in Urban Planning and the other in Public Administration, both from the University of Southern California, United States. He also holds a bachelor’s degree in Civil Engineering from California State University, United States. Cyn-Young Park is director of the Regional Cooperation and Integration Division of the Economic Research and Regional Cooperation Department. During her progressive career within ADB, she has been a main author and contributor to the Asian Development Outlook, and participated in various global and regional forums including the G20 Development Working Group, as well as written and lectured extensively about the Asian economy and financial markets. She managed a team of economists to assess the socioeconomic benefits of ADB programs and projects and provide country diagnostic studies for effective ADB support to its developing member countries. Prior to joining ADB, she was an OECD economist.